Marketing Ideas from Spinning Around at a Music Concert …. - TI Accountancy Ltd.
Marketing Ideas from Spinning Around at a Music Concert …. One of my guilty pleasures is live music!! I would hate to add up all that I’ve spent on gigs, concerts and festivals over years, although the memories I have from these events is priceless. All my snapchat and Facebook friends will already know that last week I went to see Kylie Minogue in Manchester. This isn’t the first time I’ve seen her; over my daughter’s 24 years we’ve seen her 9 times. This time though I noticed something new. The arena had the usual seating and standing arrangements however the standing section had been split into two. 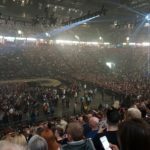 The section around the stage had been partitioned off for her super fans …those that were willing to pay extra to get a better view of the tiny pop princess. This is another example of the 80/20 principle. If you haven’t heard of Pareto’s principle there is a blog that explains it well here and see how Pareto saw that there was a 80/20 rule in most things. This means that 20% of your clients will generate 80% of your income. The highest 20% of your clients will take up 80% of your time. So in short you can guarantee that if you offered a higher value product, 80% would continue to pay the lower price but 20% of clients would be willing to pay for a higher value service. Other businesses have been doing it for years … first class on trains, priority boarding on flights. None of these costs the companies much, if anything, in service but add profit direct to their bottom line. Whatever your business you can add a premium service into your offerings, think of things that won’t eat into your cost of sales but offer value to your client. If you’ve been to Alton Towers you’ll have seen this working well with their queue jumping tickets. Each person that is going on the ride would have still paid for a ride ticket, but those that don’t want to wait in a long queue can pay extra to “jump the queue” and get on sooner. This has zero cost to the park but value to the paying visitor. Just like sectioning off the stage at the Kylie concert, all those people would have attended the concert anyway but for the price of a few barriers those who wanted to make sure they were close to the Australian singer paid extra to do so. Once you’ve worked out your own equivalent of this you’ll find 20% of your customers choosing the higher value product. Just think what this could do your profit margin!! So why don’t you get your thinking cap on and figure out your premium product instead of just wishing that “you should be so lucky”!